Conference attendance without conference travel time and expense! Changes: Moving Forward, 2018 UW System Learning Technology Development Council Virtual Showcase is a FREE education technology conference that you can attend anywhere you have an Internet-connected computer. The conference will be held on Tuesday, April 3rd & Wednesday, April 4th, 2018. On Tuesday, April 3, at 8:45 AM, keynote speaker Leah Chuchran-Davis will give her talk “On Your Mark, Get Set, Go! How Digital Learning Skills are Shaping the 21st-Century.” Jamie Seger and Paul Hill will present on “Change…The Spark of Innovation” on Wednesday, April 4, 2018. 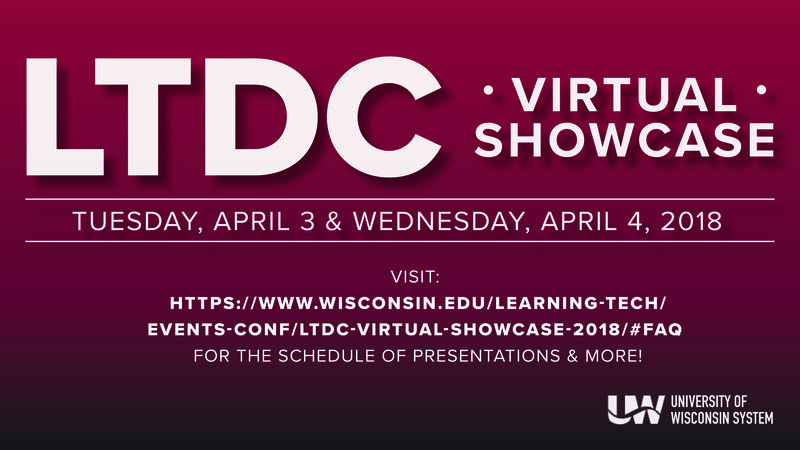 In addition, there are 30 sessions presented by instructors, instructional designers, and instructional technologists from all over the state of Wisconsin on a wide variety of topics. If you have any questions about the event feel free to contact the UW-W Learning Technology Center. This entry was posted in Conferences & Seminars, For Instructors and tagged For Instructors by Andrew Cole. Bookmark the permalink.